Ed Senn and I were hungry and looking for a good meal. I pulled out my phone, opened the Yelp application, and ran a search on restaurants. The nearest of them with a good rating was The Golden Hind. We thought we were on track, albeit with a slightly off name, when we walked into The Golden Eagle. We asked the bartender for a good fish and chips place nearby, and without hesitation, she recommended The Golden Hind. We walked in doors adorned with stickers from the various food rating services (Zagat, Yelp, etc) and found ourselves in a fairly crowded restaurant. We were seated almost immediately and service continued to be prompt and efficient throughout the meal. Although the tables were crammed close enough that an errant fork could gain you a bit of a neighboring table's meal, it made people-watching all the better. Ed and I noticed the crowd was very local-heavy, a good sign that the food is authentic and delicious. As we saw the food being delivered to tables around us, I began almost salivating at the sight of such delicious fried fish. 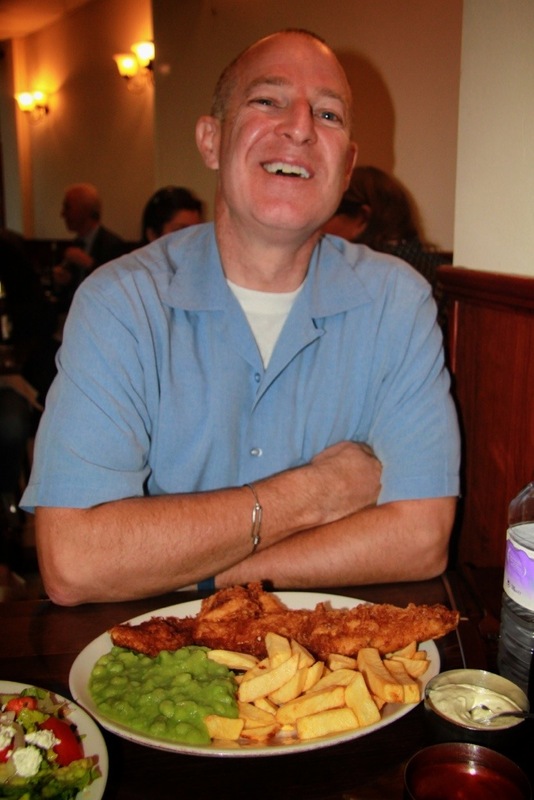 We each ordered a fried fish (cod) with the traditional sides of mashed peas and chips for a very proper fish and chips meal. Ed ordered a Greek salad for us to share as well. The food, arriving quickly and fresh from the fryer, was as fantastic as expected. The fish, being the center of attention, was quite incredible, definitely the best fried fish I have had in London. It was perfectly white and delicate, with each stroke of my fork flaking off beautiful pieces of hot, fresh fish. The breading was also quite unusual. It was substantial and deeply flavorful, yet light and not oily at all. It added a perfect crunch to the fish and chips, with the peppery breading infusing into the fish and soaking up the malt vinegar I was adding. The generous portion of fish was a good-sized amount, but with flavor like that, I could have easily eaten another few pieces! The sides were also incredible, with the Greek Salad really standing out. 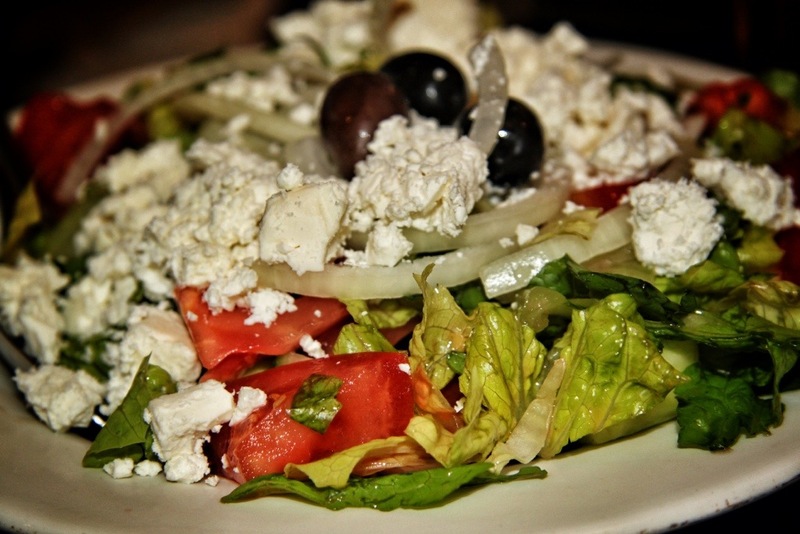 It was perfectly proportioned, with a generous topping of feta. Its vegetables were all very crisp and fresh; the tomato was absurdly delicious and a deep red to its core. It was a refreshing option to cleanse the palate between the fish and chips and mashed peas. Speaking of those classic sides, they were scrumptious. Both had a perfect texture and consistency, the fries with their crisp outside skins and the peas with their firm-yielding-into-soft texture. 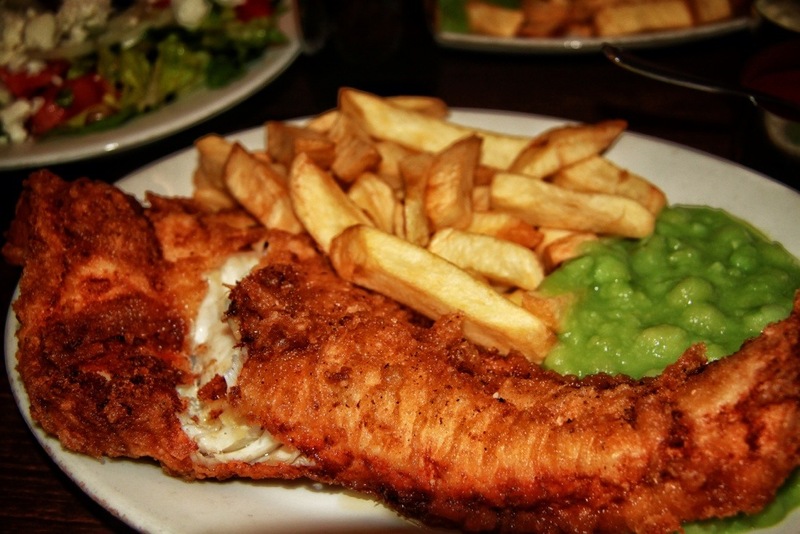 Combined with the fish, the triumvirate of fish, mashed peas, and chips is quite unbeatable. Overall, The Golden Hind has provided a worthy benchmark for my quest to find the Best Fish and Chips in London. It was so kind and generous of Ed to treat me to such a fantastic meal. The combination of a perfectly crusty fish with the well-executed sides make it the fish and chips to beat! Yumm!! The fish and chips look fantastic, definitely worthy of being on your top-ten list. But I’ll pass on the peas! And you call yourself a traditional fish and chips fan?!? ?